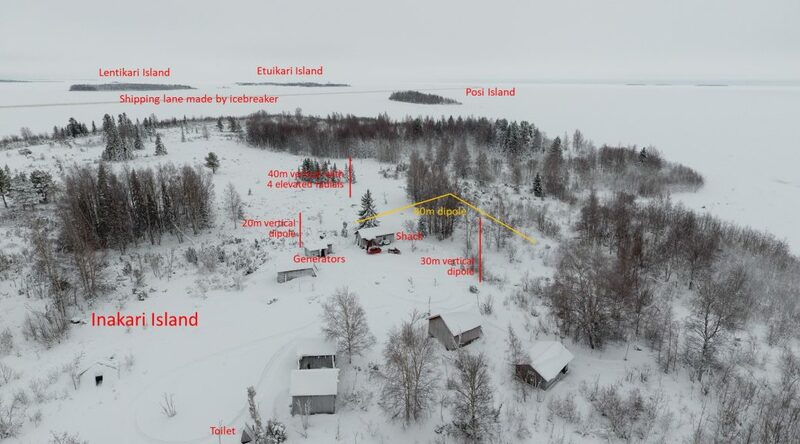 Based on the “split sovereignty island” criteria of the IOTA Program, I found Kataja/Inakari Island a potential qualifying island, since it was divided between Sweden and Finland. The island is located in the northern part of the Baltic Sea and some 15 km south of Tornio. 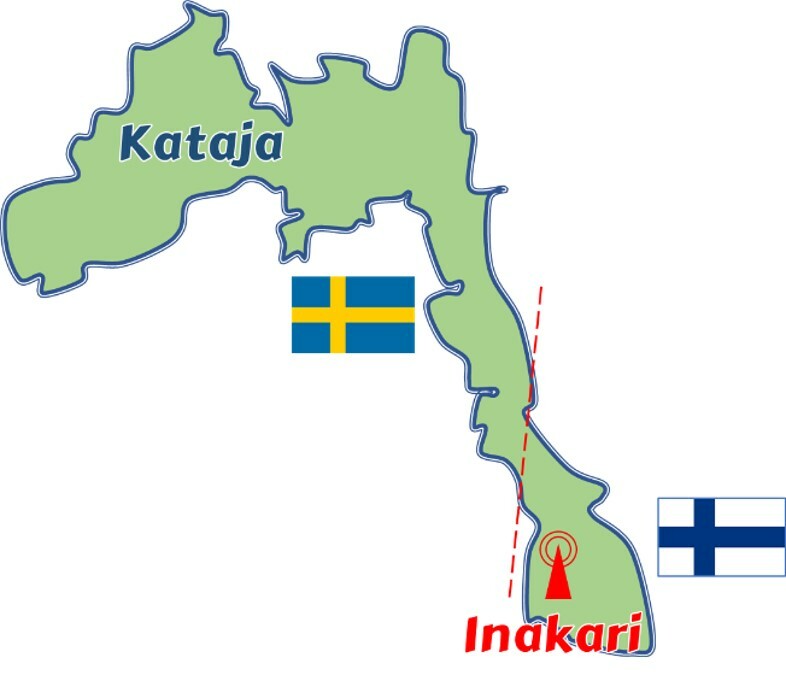 The border was established in 1809 between two islands, a larger Swedish one called Kataja and a smaller Finnish one called Inakari. In the years since then post-glacial rebound has caused the land in the region to rise relative to sea level, joining the two islands that now cover an area of 0.71 km². Some 10 years ago I made my first attempt to get Inakari/Kataja island approved for the IOTA program, but did not work out. Over the years I further investigated to get more evidence and also exploring how I could get to the island and find accommodation for the operation. Until recently, I was only considering a trip during the summer. On August 31, 2018 the IOTA Management announced they would consider new additions to the list and I submitted my new application before October 1st. 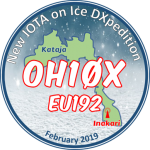 The Announcement of New IOTA Groups at RSGB Convention on 14 October 2018 provided the following information: EU-192P SM/OH Kataja Island, Finland/Sweden (=Kataja) 65º41–65º43N 24º07–24º11E New ‘split sovereignty island’, located in the very north of the Gulf of Bothnia. Since the signing of a bilateral agreement in 1809 ground rise has caused the Swedish island Kataja and the smaller Finnish island Inakari to merge forming a larger island 2 km long. The border between Sweden and Finland now crosses the island, similar to Market Reef. No known previous amateur radio activity. With that announcement I started to accelerate my effort in getting a DXpedition together. 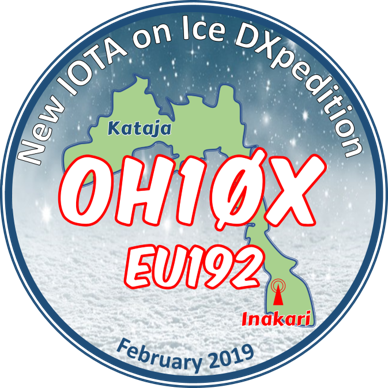 Since summertime was still far away, I considered also to make it a winter DXpedition but obviously needed to investigate a lot more on transportation, accommodation and weather circumstances. Temperatures in the region can easily go down to -30° C which brings in a lot of complications. As of October 2018, all kind of options were considered which resulted in a provisional plan by January 2019. At the same time, I got Martti OH2BH committed to join and soon after we had also Nigel G3TXF and Niko OH2GEK joining the team.With a Finnish party involved, it was obvious that we also explored the options to visit Inakari vs. Kataja on the Swedish part. Martti even made an exploration trip to the region to collect valuable information and met with key people for the logistics and support.Going to Inakari Island during the winter by using a snow mobile and crossing the frozen sea was no problem, but we got a strong advice that we should not go with temperatures as low as -20°C. Since we did not want surprises and put ourselves at risk, we had backup scenarios in case any kind of problem would develop during the transport to and from the island or when staying on the island. Imagine changing weather conditions or illness of one of the team members. As a result, we could count on a small hovercraft that could be used in case of emergency. Although we could consider tents for our stay on the island, there was a clear preference for a more comfortable solution, i.e. a cabin that exists on the island. Besides that, the Finnish Nature and Wildlife Organization will not allow overnight stay in a tent. Obtaining access to a cabin on the island would allow us to stay 24 hrs/day on the island. During the fact-finding mission in January, Martti was able to get the keys of one of the few fisherman’s refuges which was a major development in our planning. He further made all other necessary arrangements with the authorities and government departments to have all permissions on hand. We were eagerly looking for an improvement in temperature forecast. At arrival in Tornio, it was still very cold! With accommodation and transportation secured, we started to work on all the equipment we needed for running two stations simultaneously. 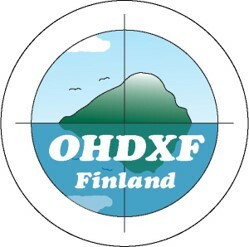 With two OH hams in the team we had extensive experience to know how difficult propagation can be in the northern hemisphere and thus a challenge to cover all continents. For that reason we also did not plan to have antenna’s for 10 and 12 meters as it would be very unlikely that we would have openings on those bands.Since the operation would only last a couple of days, we wanted to have antenna’s that could be installed quick and easy in an environment with at least a meter of snow and temperatures possibly around -20°C. Therefore, we took fiber poles for vertical antenna’s and a dipole for 80 meters. We had vertical dipoles for 15, 20 and 30 meters and a vertical with 4 elevated radials for 40 meters. For 17 meters we had a VDA but finally did not install it. For the power supply we had several options but finally decided to bring two Honda EU20i generators. That would allow us to run two station with amplifiers. The more bulky bigger generators would have been good as well but were simply to heavy and very difficult to move around in the snow on the island. For the radio’s we planned two Elecraft K3S and a K3 as a backup plus two SPE 1.3K amplifiers and a SPE 1.5K as a backup. All other equipment such as Band Pass Filters, coax cables, laptops, 4G-WiFi router, tools, etc. were carefully selected.Now we had everything organized and prepared, we needed to observe the weather forecast of the Finnish Meteorological Institute We wanted to build our short operation around a weekend and were targeting the weekend of 9-10 or 16-17 February where the forecast showed some improvements in temperatures. Once we could see that the temperatures during the weekend of 9-10 February were in the range of -10 to 0 C, we got an OK from the transport and support team on 31st January and booked our tickets to fly to Kemi, some 25 km from Tornio.Nigel-G3TXF and Gerben-PG5M flew to Helsinki on February 6 and the next day they were accompanied by Martti-OH2BH and Niko-OH2GEK and few together to Kemi from where we drove to Tornio where we spend the night. The next morning, we went to the harbor where we met the support team and started to load the sledge with all our equipment and luggage. In addition, there was food, fuel for the generators and wood for heating. For the transport of the four operators, there was a snow mobile towing a 4-person capsule and provided with a simple heating system!After a 30 minutes snow mobile drive over the beautiful froze Bothnic Sea we arrived on Inakari Island at noon. There was excitement when we finally saw the fisherman’s refuge we have been talking about already for some time and which would be our home for the next days. Our support team had visited the refuge already the day before and performed cleaning and placed a gas heater. It was kind of surreal when we opened the door and stepped into a warm cabin with a kitchen, tables, chairs, heaters and beds. This was the ideal home for our DXpedition. The sledge with all our equipment and luggage. Comfortable passenger capsule with heating! The cabin on the right was our accommodation, kitchen and living/sleeping room. Station 1 was in the kitchen en station 2 in the living room. We quickly started to off load all equipment and personal stuff and started to build the stations. Firstly, the wood stove was heated up and the two Honda generators brought into operation. One group looked after setting up the radio station and the other worked on the antennas. We wanted to make sure that we had the antennas for 40, 30 and 20 meters ready before darkness. Those were the bands we expected most QSO’s would be made.Just before we went on the air, we released the news via Twitter and the usual DX media that we would come on the air. Our first QSO was with OK2PAY on 2019-02-07 at 16:03 GMT on 30 meters. Quickly the second station started its operation on 40 meters.In the meantime, we were arranging our personal stuff and got the kitchen organized in order to have our drinks, coffee and tea and snacks. Every day we had our support team coming to the island to bring us fuel for the generators, wood for the stove and food. Sometimes we got scrambled eggs with bacon for breakfast or a great dinner in the evening. That was amazing. It looked like a hotel service. It should be noted that Niko also proofed himself to be a great cook and serving us scrambled eggs and bacon or grilling sausages in the wood stove. On Saturday we got a visit from a local TV station that did an interview with Martti and they also flew a drone to capture the whole area where we were operating. The same evening the interview was aired on local and national TV. As expected, conditions were not really favorable which limited our operations which was in line with our choice of bands/antenna’s. Sometimes we continued to CQ and worked every few minutes a station but continued to maximize the QSO’s in the log. We were lucky with a nice opening on 30 meters towards Japan and thanks to the cooperation of the European station we were able to get over 100 stations in the log. Martti was able to work quite a number of US stations on 20 meters SSB. Unfortunately, Oceania and South America were difficult to work and resulted in only a small number of QSO’s. Nigel G3TXF demonstrating for the local TV crew. Martti OH2BH operating SSB on 20m. Niko OH2GEK operating CW from the "kitchen" station. Sunday was a different day with a lot of sunshine and temperatures climbing above 0º Celsius. Snow started to melt and was sliding off the roof and it looked great outside. However, in the evening the temperature dropped rapidly and it started snowing. This change in weather turned out to be cause a bit of a problem for us the next day when we had to dismantle the antenna’s. The fiber poles we used were completely covered with snow and ice and the thin guy wires were now about 1 cm thick. That made it difficult to get it loose from structures and trees where we fixed them but the biggest issue were the fiber poles. We took the poles down in full length and brought them in front of the cabin and use hot water to de-ice them after which we succeeded to collapse them in transportation length. The guy wires we left for a while close to the wood stove to get most of the ice melted. The metal wires of the 80 meters dipole were also fully covered with ice which caused the resonance frequency to drop by approx. 100 kHz! Balun of 40m vertical with 4 elevated radials. De-icing of the 15m long fiber pole. We had the luxury to have an open toilet but using it in -15ºC was a challenge as you can imagine. Around 12:00 we had the sledge packed with all our equipment and luggage and started our trip back to the main land. The sun was shining, and it turned out to be a fantastic view when we were on the frozen sea and having the other surrounding islands in the distance. After 30 minutes we arrived at the harbor of Tornio from where we went to our hotel. The next day we flew back to Helsinki and Amsterdam and London. Our operation resulted in 8088 QSO’s and details can be found on Clublog. A "drone" view of the island and surrounding. 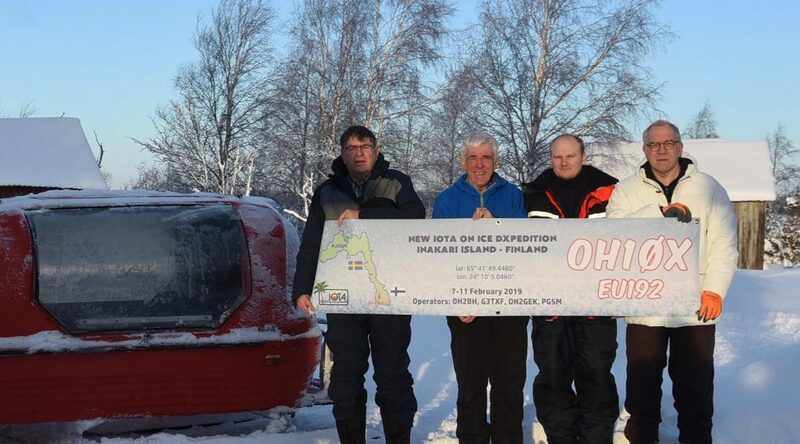 Martti OH2BH, Nigel G3TXF, Niko OH2GEK, Gerben PG5M, together good for 175+ years of Amateur radio experience! We like to thank our main sponsors IREF and OHDXF but also the numerous donations we received from individuals via ClubLog OQRS.